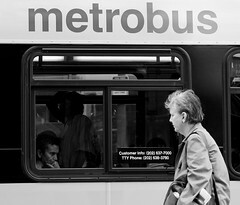 Metro has reorganized all of the hierarchy for Metro bus drivers. They started with just three garages, but have now deployed this system to all of the area garages, and they’ve collapsed some of the management bureaucracy and turned to their midline managers to help address customer service complaints. What’s this mean? Well, instead of each garage superintendent handling all the complaints for several hundred drivers, this is now a task for someone who might manage 20-30 drivers. Sounds like a no-brainer, but it’s cut down on complaints over the first quarter of 2009, and helped address some safety issues that might have gotten missed before. Well done, Metro.